This product’s price is on the high end, but the 90-day guarantee and the pure ingredients make this softgel a must try. After about 7 days you should expect to feel the full results from the CBD. Read the directions, start with one serving and see how your body reacts. This product is now a permanent member of my medicine cabinet. It replaced my pharmaceutical pain relievers and anxiety suppressants. 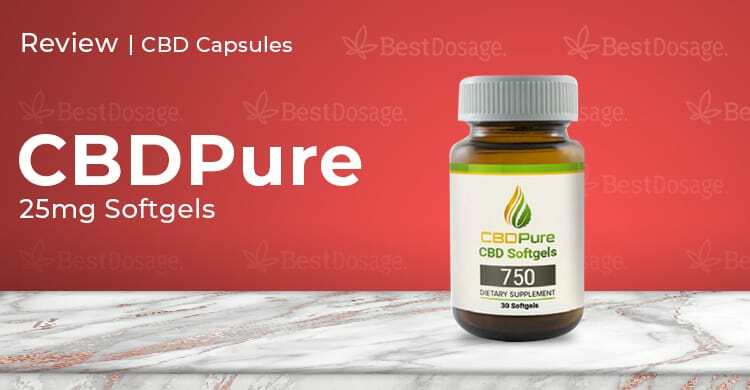 I recommend you add CBDPure’s high-dosage softgels to your arsenal of CBD products. We chose CBD Pure softgels as the first product of this brand to review. What drew us to CBD Pure was their 90-day money-back guarantee. With that backing, this has to be a good product, right? CBD Pure is one of the few companies we’ve come across that focuses exclusively on CBD oil. But this is a review for CBD softgels you say? Well, these softgels are just a way to swallow CBD oil in a quicker, perhaps “cleaner” way. They extract full spectrum CBD oil using a chemical-free CO2 process, which we know to be the best extraction method in use. CBD Pure uses certified organic industrial hemp grown in Colorado, free of harmful pesticides and herbicides. The hemp used has been chosen selectively for its high CBD content and is grown with great care in order to produce a high-quality product. All CBD Pure products come with certified lab tests and reports for each lot number and batch upon request. CBD Pure uses a chemical-free CO2 extraction process to pull the CBD from the hemp plant. The process is free of any harsh chemical solvents often used to extract CBD oil. CBD Pure Softgels 750 contain naturally occurring cannabidiol, terpenes and other cannabinoids to promote overall well-being. Each serving of CBD Pure Softgels delivers 25 mg of CBD. The CBD Pure softgel bottle looks and feels very much like an all natural supplement. The bottle is light brown and the label is white. When I opened the softgel bottle I did not pick up on a distinct smell. The softgels feel very oily making them easy to swallow. The first time I consumed the softgel I did so without water, just to see if the oily softgel would go down even without water. I was right, it goes down very easily. I wouldn’t recommend consuming without water, I just wanted to show how easy these softgels are to swallow. The serving size is one softgel, each softgel contains 25mg of CBD. Like every other softgel I tested, CBDPure takes about two hours to fully set in. But once it does you feel an immediate body and mind relief. This softgel worked very well for me. The effect I felt was very similar to a high dosage pharmaceutical only without the terrible side effects. I recommend eating a full meal before you take the softgel or you can get a slight stomach ache. Overall, I felt around eight hours of relief after the softgel kicked in. CBD Pure consists of only two ingredients. The first ingredient is organic hemp oil. The second is the concentrated hemp extract that contains organic CBD. The softgel material is made from gelatin. Which is the only downfall of this product. CBD Pure does not offer free shipping, but they do ship to every U.S. state, minus Arkansas (AR), Kansas (KS) and Louisiana (LA). They do not ship Internationally. Contact customer support for a free shipping code. $100.00 for 30 softgels, or a 6-month supply at $70.00/30 softgel bottle. This product’s price is on the high end, but the 90-day guarantee and the pure ingredients make this softgel a must try. After about 7 days you should expect to feel the full results from the CBD. Read the directions, start with one serving and see how your body reacts. This product is now a permanent member of my medicine cabinet. It replaced my pharmaceutical pain relievers and anxiety suppressants. I recommend you add CBD Pure’s high-dosage softgels to your arsenal of CBD products.